U.S. industrial production climbed for a fifth consecutive month in June, driven mainly by gains in the mining sector, according to data released by the Federal Reserve Board on July 14. The industrial production index—a measure of output for all U.S. facilities including factories, mines, and electric utilities—rose by 0.4 percent in June from the month before and 2 percent year over year. The month-to-month gain was better than the consensus forecast of 0.3 percent. And for the second quarter, industrial production grew at an annual rate of 4.7 percent. Much of the gain was driven by the mining sector, which covers oil and gas extraction, coal mining and drilling, and support services. Mining output increased by nearly 10 percent compared to last year, buoyed mainly by the boom in U.S. shale oil production following OPEC’s decision to cut supply. The rise in U.S. shale output highlights the improvements in drilling efficiency and well productivity despite low oil prices, according to analysts. 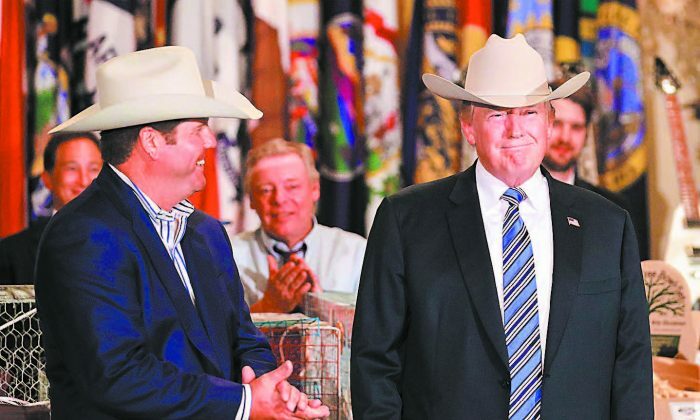 “We picked up 45,000 mining jobs in a very short period,” said President Donald Trump on July 17, during the launch of “Made in America” week at the White House. Since October last year, the mining sector has added 56,000 jobs, according to the June report by the U.S. Bureau of Labor Statistics. “The recent job growth correlates with increasing domestic oil rig counts,” stated the report. We want to build, create, and grow more products in our country using American labor, American goods, and American grit. The president signed a decree to make July 17 “Made in America Day,” to celebrate American manufacturing. “For decades, Washington has allowed other nations to wipe out millions of American jobs through unfair trade practices,” Trump said. He promised to provide a level playing field for American companies. “We want to build, create, and grow more products in our country using American labor, American goods, and American grit,” he said. Trump also pledged to remove “the burdens and regulations” on companies. “A lot of those regulations have been taken off; the rest are coming off,” he said.